We are currently living in Barcelona, the capital city of the autonomous community of Catalonia and one of Europe’s most popular destinations. Definitely, an enchanting beautiful mediterranean seaside city with boundless culture, amazing architecture and a very exquisite gastronomy. Cosmopolitan, modern, avant-garde, multicultural, eccentric, historic, artistic, innovative, glamorous and considered by many to be among the most beautiful cities in the world. Barcelona can be a very easy and pleasant city to visit or to live in. All the places are very well connected due to the excellent transport infrastructure. One can go anywhere in a fast and comfortable way. Not to mention it’s climate, a lifetime treasure. It’s such a perfect city that can be easily transformed into an enormous tourist trap. So if you are really thinking to come to Barcelona, we are sure that we can help you with some really nice hints about it. Get ready to dive into the unique atmosphere of this city. Seven years passed since I moved to Barcelona. After being in Erasmus, Paulina decided to stay one year, which is already gone for her. We live in a cozy flat in el Born, a charming and trendy neighborhood which is ten minutes from Barceloneta beach by bike. In the beginning, I wanted to experience other cities in Europe and thought wouldn’t be here for more than three years but I felt so identified with this city that I decided to stay and start a living. We consider Barcelona a city of details. The first times we visited it, we just couldn’t get tired of walking around through the different neighborhoods and narrow streets. Even if we passed in the same street more than once we would always discover something new. 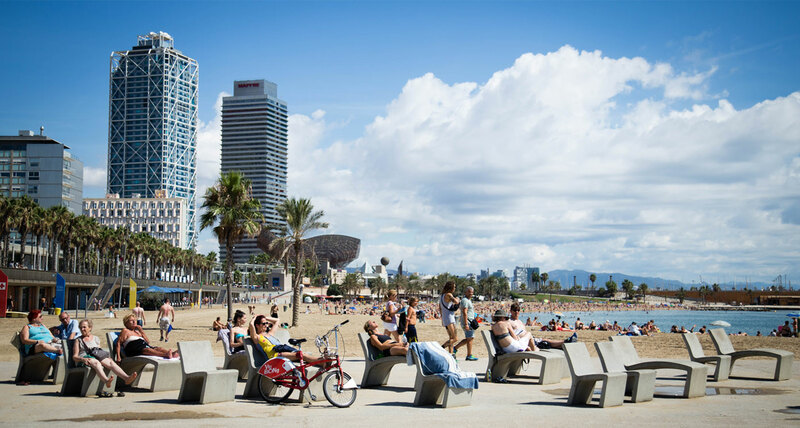 There are great cities suitable for relaxation and leisure, others for business and to build a professional career, but Barcelona it’s a special kind of city that can balance the demands of a successful economy and provide a high quality of living to its citizens. Every year, millions of tourists come to visit the most popular attractions like Sagrada Familia, Parc Guell or La Rambla, not really experiencing the real vibe of this city. What if there’s a different way of getting to know this amazing city through the eyes of locals? Feeling the Catalan flow and traditions through old bars and hidden places? To start your mediterranean adventure with us, we would like to offer you a free travel guide with our ten best moments of yūgen in Barcelona. There, you will find a bit of ourselves, our experiences, useful travel hints and much more to help you in your travel. Download for free moments of yūgen in Barcelona. I’m student of architecture faculty., and visit Barcelona within short time.l hope your guide can helpful to me. Hi there Urja 🙂 thank you for downloading our travel guide! We are sure you will going to find it very useful. Let us know which was your favorite moment.